The big question now is often not how or what is being affected by pollution, but who should pay for it. For Vien Truong, director of Green For All, the answer is simple: whoever creates the pollution should pay for it. “We are calling for polluters to pay for what they break, to make polluters pay for what they do to our communities,” said Truong. To make that statement a reality, this week Green For All, a group focused on giving people of color a voice in the environmental movement, launched a national campaign for each state to create a Polluters Pay Fund. Truong said the funds would go to environmentally and economically disadvantaged communities via programs that communities develop. We are calling for polluters to pay for what they break. The way this would work, according to Green For All, is that as states draft plans to reduce their carbon, they would make polluters pay for the carbon allowances given under the Clean Power Plan, and then invest that money back into the communities hardest hit by their pollution. Essentially, it would be a carbon tax, an anathema concept for many politicians. Green For All is doing its first push for the Polluters Pay campaign in Flint, Michigan, a city that’s been battling a lead poisoning crisis for several months. High chloride levels made the water excessively corrosive to Flint’s pipes, which polluted the water with lead. The chloride polluting the Flint Riverlikely came from salts used to keep ice off the roads during the winter, and Flint did not apply corrosion inhibitor chemicals commonly used to mitigate such problems. Two state and one city official so far have been charged over the water crisis, while various lawsuits are ongoing. 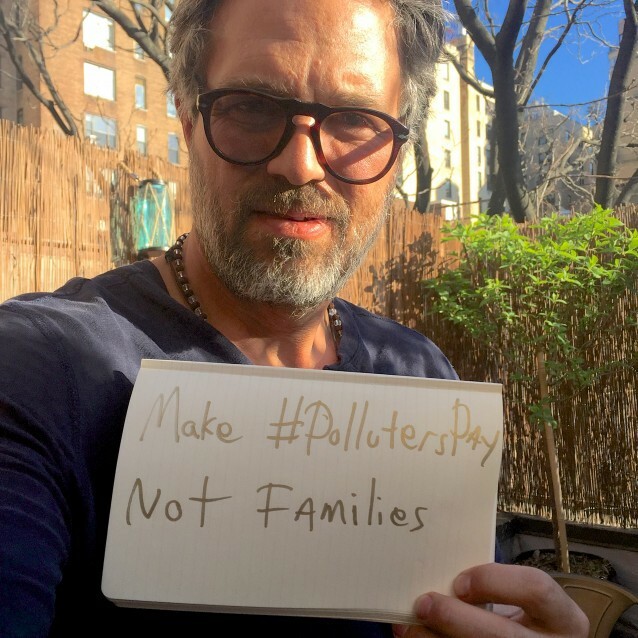 Green For All is inviting celebrities, community leaders, and organizations across the country to sign a petition and take part in a day of online action this Earth Day using #PollutersPay and #FixFlint on social media. The campaign has already been favored by actor Mark Ruffalo, though Green For All said more are likely to join in the coming weeks. In the coming weeks, Green For All will be releasing toolkits in partnership with major environmental groups laying out recommendations for how states can implement their own polluters pay fund. There will also be a series of events across the country to educate stakeholders on this policy model. This Polluters Pay campaign might seem grandiose due to its national scope. But it’s not unprecedented in the United States. In fact, it’s based on California’s Climate Investments Fund, a law that Truong designed and pushed for some five years ago. The Climate Investment Fund mandates that 25 percent of the state cap and trade funds are spent on disadvantaged communities. The fund has helped people all over California in the last couple of years, and it’s growing fast. “By the time we get to 2020 it’s going to be close to $12 billion,” said Truong. “It’s created the biggest fund in history for low-income families in any state.” And the benefits are already trickling down. In 2015, for instance, GRID Alternatives, a nonprofit, received $14.7 million in climate investment funding to install solar panels on low-income households. People are going to race to support it because, you know what, it’s going to fund the things that they want to see. The California experience could be a sign that so-called polluters pay funds could multiply across the nation. After all, California is a pioneer in progressive laws and programs that other states then pick up. Yet, creating a polluters pay fund puts communities against polluters, which are often wealthy businesses or corporations that oppose more stringent laws in the first place. What’s more, Green For All proposes the Clean Power Plan, a court-challenged rule that calls for reductions in carbon emissions from the electricity sector, to be used as a vessel for the fund. The plan, now under a Supreme Court stay, has been opposed by many lawmakers and multiple states. However, the rule also enjoys its share of support and some states are moving forward with it. Truong said a polluters pay fund attached to the plan could bring communities to rally around the controversial rule. Truong is convinced on the opportunity, despite the bad reputation carbon taxes have among many lawmakers. “What we saw in California is that even the Republicans began supporting the program because they like ribbon-cutting as much as anybody,” she said. Still, he said public opinion surveys that show that the public is strongly in favor of many actions to address environmental problems like climate change. And Green For All — along with the organizations partnering with it — is determined to make the campaign a success.